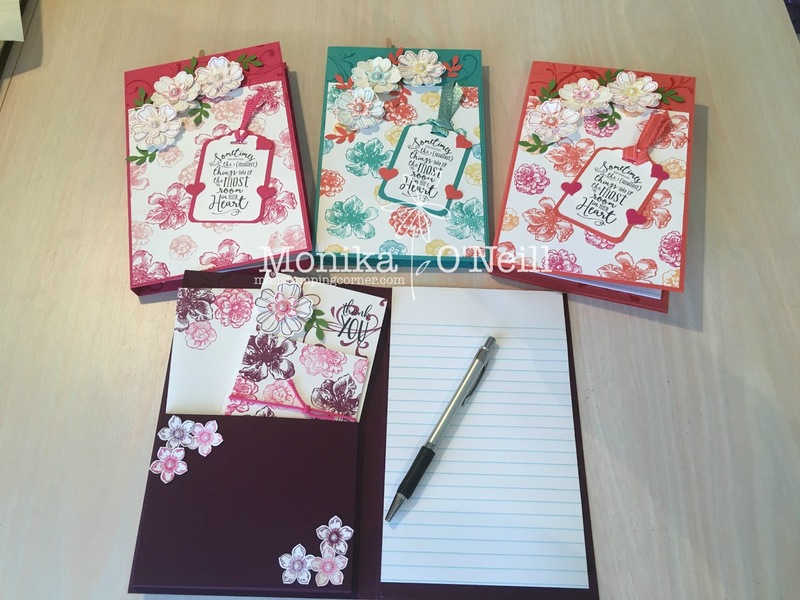 Hi everyone, these are writing sets and a blank Thank You note card using the Note Card and Envelope set, the pad can be replaced, I bought them from the Reject shop and they fit perfectly. I CASED this from Brandys cards tutorial which I have attached below. I have listed the products below that I used as they are slightly different. Brandy has made the notepad permanent but I cut a piece of card stock 2inch x 6 inch and scored 1/2 inch on each side and glued each side down just over 1/4 from the top and you just slide the back of the pad in. Brandy's tutorial will give you all the instructions to construct this lovely set. 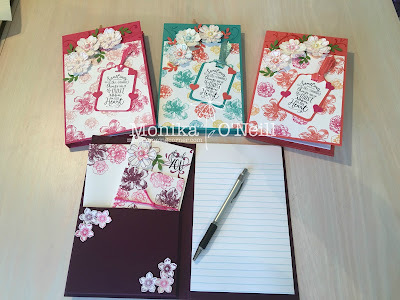 I added an extra mat on the front cover under the whisper white and on the back behind the writing pad for extra strength, I also stamped the all over the back cover and inside cover with the Flourish stamp from the First Sight stamp set. Unfortunately the flowers I stamped on the whisper white are now retired but you could use any flower stamps you have. If there are any products you need to make this set just click on the product and it will take to my shop.